Coppicing is a form of woodland management that has shaped Ruislip Woods for hundreds of years. It involves cutting down hornbeam trees, leaving a stump about one foot high which allows new shoots to grow from the stump. This extends the life of the coppiced trees indefinitely. Some of the larger coppiced hornbeams in Ruislip Woods are over 500 years old. 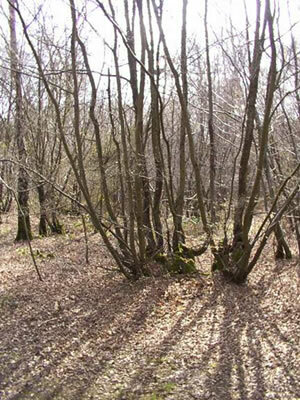 There are many different types of coppicing and in Ruislip Woods the method used is ‘coppice with standards’. This forms a two-storey woodland, with coppiced hornbeam beneath and other trees growing through them as standards - in our case oaks. Standards were left to grow to about 100-200 years old and then harvested for use as timber for buildings. Ruislip Woods oak is rumoured to have been used in the Tower of London and Windsor Castle. We don't harvest the oaks anymore. About 60% of Ruislip Woods is coppiced over a 20 year cycle and the rest is left un-coppiced. Only those areas that have been coppiced in the past are re-coppiced. The reasons for coppicing have changed over the years. In the past trees were coppiced for fire wood, charcoal production, bean poles and pea sticks. Nowadays timber production is combined with management for conservation. We do take some of the coppiced hornbeam to make charcoal to sell in the Woodland Centre at Ruislip Lido (our customers don't have to buy it from less sustainable sources such as tropical rainforests). The most important reason for coppicing nowadays is the benefit it provides for wildlife. Rotational coppicing maintains a small-scale structural diversity, with a constantly changing pattern of cut-over areas, scrub thickets and open areas. In the first years after felling, herbaceous plants germinate and flower. Their seeds then survive in the soil when the canopy is closed. These newly opened areas, covered in floral growth, attract many insects, including butterflies, moths and beetles, which in turn are food for birds and bats. From 3-5 years after coppicing, as the new shoots of the coppiced stools grow, brambles, honeysuckle and bracken take over from the herbaceous plants. From 5-15 years, coppiced areas become thick impenetrable havens for larger mammals such as muntjac deer, foxes, stoats and weasels which can forage without being chased by dogs. It is also superb for small nesting birds such as warblers, dunnocks and wrens. By now the hornbeam coppice shoots have reached up to 20 - 30 feet and out shade all else. The long close growing branches make excellent nests for blackbirds and thrushes. The area will then be ready for coppicing again after 20 years. In the past all the wood from coppicing was used - even the small branches and leaves. This has led to a depletion of lying and standing dead wood which is essential for woodland ecology for fungi, invertebrates, small mammals and amphibians, in fact just about everything. This is why visitors to the Woods will see small piles of wood in newly coppiced areas. Most is left in situ and some is taken for charcoal production. Understandably, a few people are shocked when they see a freshly coppiced area or ‘compartment’. It can look like the Somme! However, if we don't continue to re-coppice the areas with a history of being coppiced, the whole structure of the Woods will change. More uniform conditions will gradually develop, with fewer clearings and a less varied structure. This will lead to the extinction of many species which have adapted to depend on coppice conditions. Many centuries ago clearings within woodlands were kept open by large herbivores such as red deer and wild boar. Unfortunately, they no longer roam our Woods, so we are doing their job for them until they return. We have a programme in place to widen paths and seek to join paths to the coppiced areas. This allows many light loving animals to reach these newly opened up areas. In the past, dark, narrow paths restricted the movement of butterflies, bees and dragonflies. 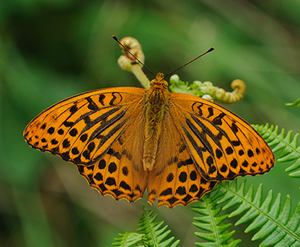 This year we saw for the first time in many years the return of the silver washed fritillary - a butterfly which forages along wide woodland paths. Only two were spotted, but hopefully this is a sign of things to come. Coppicing in Ruislip Woods is carried out from November to March in areas decided on by the Ruislip Woods Management Advisory Group. All the intensive labour is carried out by the Woodland Officer, two Park Officers and an army of keen volunteers without whose help it could not be done.